French doors provide a beautiful frame to the outside, allowing lots of natural light into your living space. These doors are practical, elegant and functional. Using the most up to date materials and techniques we'll ensure your doors not only fit perfectly but are also in line with the design of your home. French doors not only provide access to the outside world, they can be used inside the home to add a contemporary and modern touch by dividing your living spaces, offering versatility to the way you use your rooms. French doors are available in both uPVC and aluminium as well as a choice of colour options. 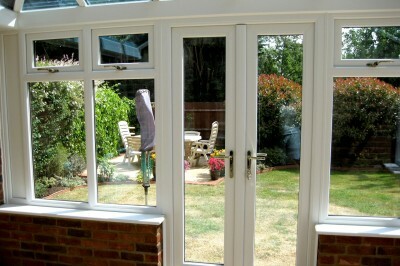 Our French doors are lead free, thermally efficient and are aesthetically pleasing. Not only that they provide your home with added security and are accredited to meet necessary standards including Secured by Design, PAS 24:2012 and compliant with the relevant Building Regulations.